DWL038 . Released August 2003 . Add To Cart : $10 . iTunes Music Store . eMusic Description This collaboration between solo electrofolkers Coltrane Motion and Velcro One finds them playing on and producing each other's tracks, without dampening the unique individuality that each artist possesses. Dominated by acoustic guitars and sampled beats, the disc throws familiar indiepop sounds against a flurry of hiphop grooves and idm breaks, held together by offbeat songwriting and a lyrical sincerity rarely heard in electronic music. And while this disc is clearly more polished than any of their earlier work, it still retains their earlier works' lo-fi charm, as it was recorded entirely in home studios, produced by the artists themselves. Reviews Take the Velvets' third album, add some Hollies' Pop and wicked break beats and you get this Electro-Indie Folk collaboration from recent expatriate and DWL founder, Michael Bond, and Swissfarlo's Tim Heyl. The duo has put out some of the most interesting full lengths and singles from other artists on their Cincinnati-based indie label, but their 11 homegrown trade-off tracks on this 'split EP' are really fantastic. Music hunting is like, well, treasure hunting; it may take years upon years upon decades to discover the greatest artifact ever, the Arc of the Covenant, the Holy Grail, yet it could take even more decades on top of that to find a folk/electronic band actually worth listening to that isn't a half-assed duplicate of a previous decade band. Dear readers, I have found that Holy Grail. 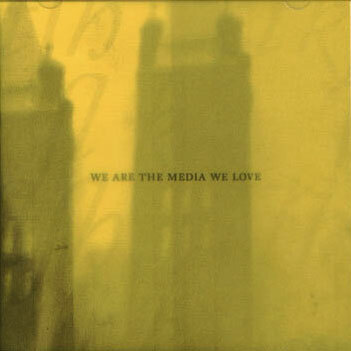 We Are the Media We Love is a split LP between two great folk-eletronic-indie blended bands: Coltrane Motion and Velcro One. The album as a whole is generally an easy listen, a fact which alone allows the music to stand-out among the clutter-sounding mess of most fad-inspired bands of similar a genre. Most, if not all, songs rest lightly on soothing acoustic guitar loops with simple, realistic, non-exaggerated electronics. The album's clear stand-outs are the first two tracks, Velcro One's "No Lemon No Melon" and Coltrane Motion's "The End of Every Movie". They are, without a doubt, the catchiest songs of the album and would most likely be the tunes to be stuck in your head for hours - or even days, as has happened to me - on end.